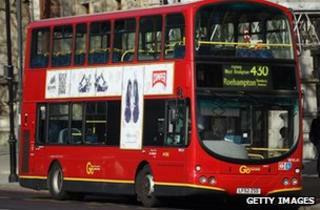 London buses are to start accepting contactless payments from Thursday. Passengers on the city's 8,500 vehicles will be able to buy tickets by swiping a credit, debit or charge card by an NFC (near field communication) reader. Transport for London follows Stagecoach which began installing NFC equipment on its buses in 2009. TfL also operates the Oyster smartcard scheme which uses an earlier RFID (radio-frequency identification) technology. However, users are being warned to be careful about swiping their wallet against readers if they own more than one NFC-enabled card. "If you present two cards together, the reader will normally reject them both," an email to Oyster card users said. "But there is a small possibility of payment being taken from a card which you did not intend to use." TfL said it planned to introduce the technology to the London Underground Tube system at a later point. The Oyster card touch-and-go system was first introduced in London in 2003 to help speed up passage through Tube gates and bus doors. Dozens of other towns and cities in the UK have since introduced similar systems. However, other types of contactless payments have been slower to take off despite Barclaycard issuing the first such credit card in the UK in 2007. One expert suggested TfL's move might change that. "There are now more than 23 million contactless cards in the UK," Windsor Holden, research director at Juniper Research told the BBC. "But surveys that we've seen suggests only a very small minority of card holders are aware that they have an NFC-enabled card. "Projects like this bus scheme are absolutely critical if the public is to be educated about the use of these cards as having them isn't enough - it's knowing how to use them, feeling confident about the security involved and then wanting to use them more." TfL will announce more details about its NFC proposals on Thursday.